The effect reminded me of when you color a sheet of paper with crayons and then paint over it with black paint and scratch your design into it, revealing the color below...if that makes sense. 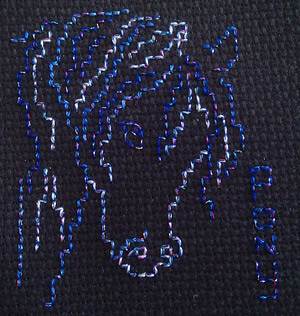 To try and mimic that effect and the images, I used a strand of varigated blue thread and a strand of multicolor metallic thread. 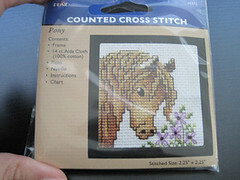 I omitted the flowers because I'm not big on them, plus it was easier to just stitch "pony". I'm now working on something new, which I think I'm going to give away next week, along with some other finished stitches.